I had the utmost privilege to visit a Wild Animal Rescue and Sanctuary. 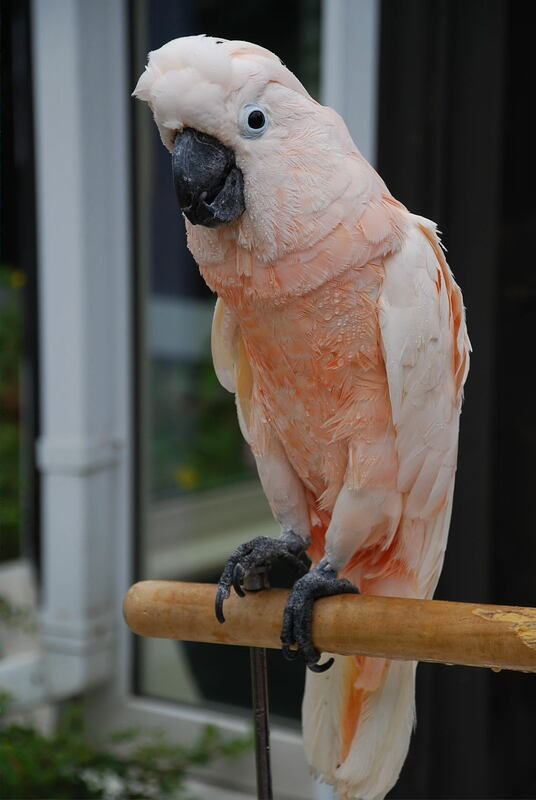 It takes in exotic animals, largely due to Illegal Trade and Owner Abuse and Neglect. What’s really amazing, is that a lot of these animals are “hands on.” That’s right! You get to “play” with them, or interact with them to some degree. The reason for that? Could this place become any better? It’s a Charitable Organization. 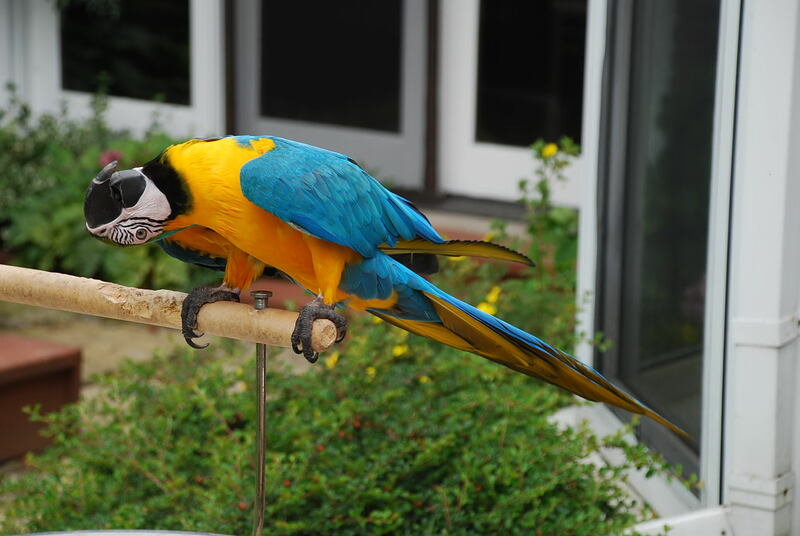 It’s purpose is to use the animals as therapy for mainly kids (but some adults) on the Autistic Spectrum-or those who have other Special Needs, Learning Disorders as well. The woman that runs it actually grew up with a Learning Disorder. Due to that, she was treated horribly as a child in school. She worked in the Educational System as an adult, and later decided this was her “Dream.” She finally made it a reality! It is so unbelievable, when you’re there, sometimes you must remember that it is a reality–not a dream! It is not open to the public, but my friend J. belonged to a Scooter Club. A woman who was part of it as well, discovered the place and went bananas! She arranged for a group of us to take a two hour trip on Scooters and/Motorcycles to make the way. The agreement was to make Charitable Donations in exchange for our visit. I went again in 2009 as you can see from the following Page. So, get ready to see some awesome critters! And some of my anonymity slipping away? I couldn’t crop all of me out! It’s worth it to share this though! 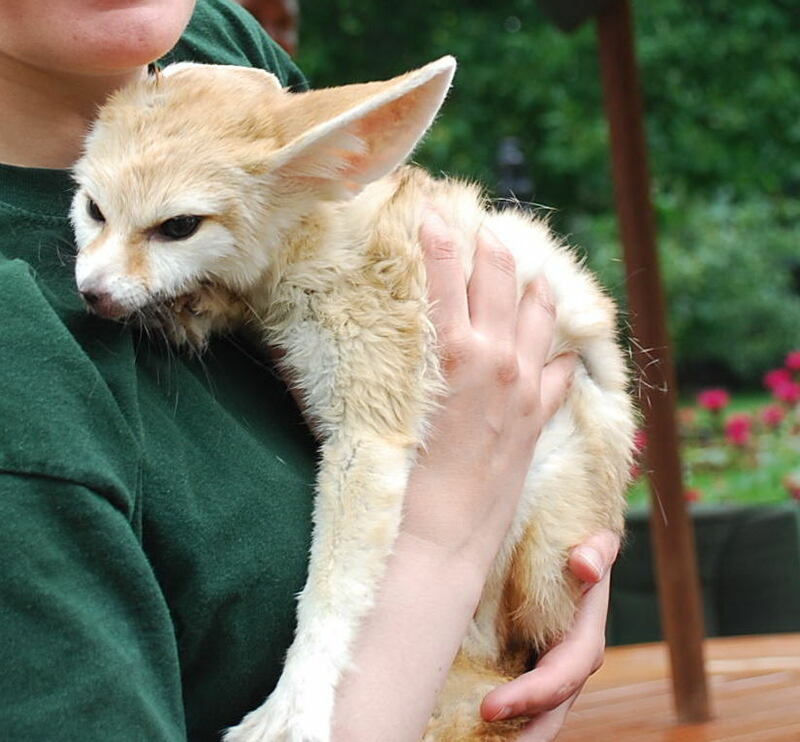 This is me holding a Fennec Fox. What do you think? Pretty pink, huh? This bird, minus tail, measured at least a foot in length/height? 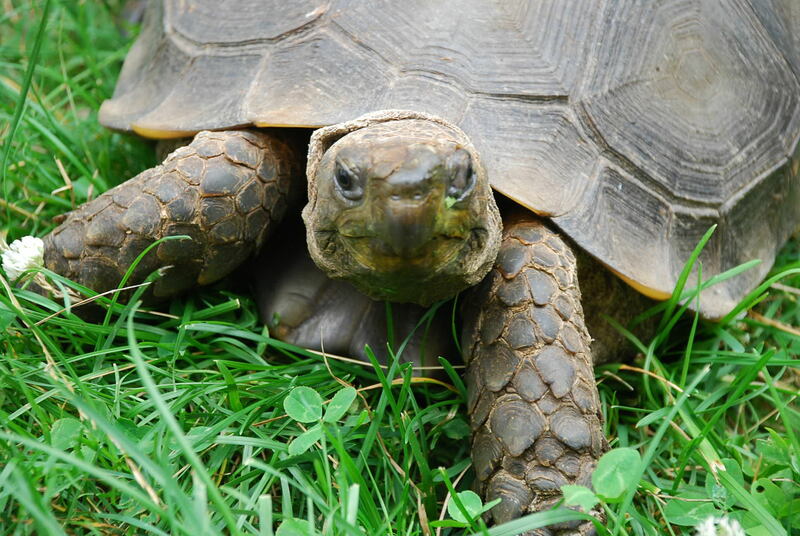 Here’s a Turtle! Or would it be a Tortoise? I’m not sure. However, I will tell you that he (or she?) was HUGE! A little over a foot in length and in width? A little under? HA! EDIT: As per a commenter (Jen) we have some more information. 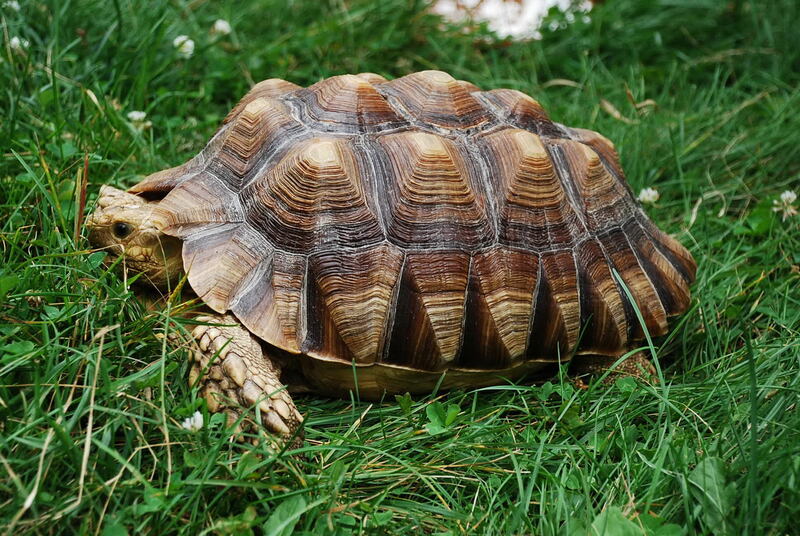 This is an “African Spur Tortoise.” I believe we are referring to the one above. It appears someone has something they’d like to tell us here. The goat wanted to have an exchange, as well. 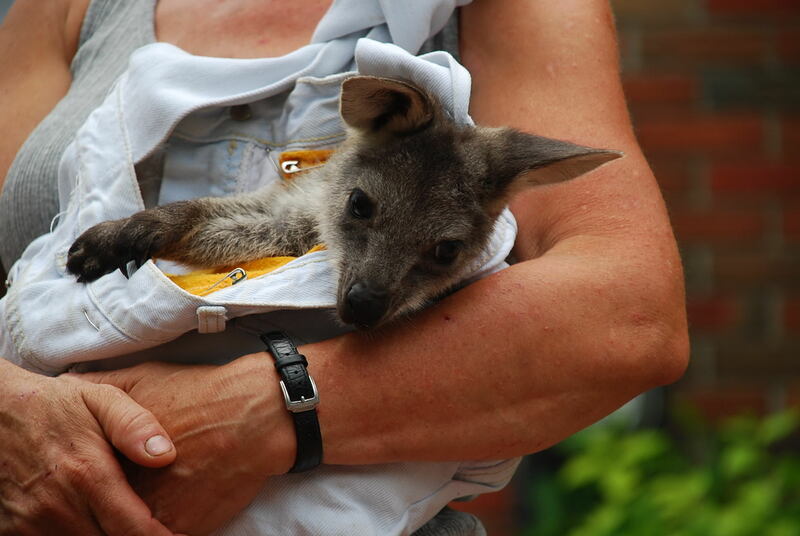 This is a baby Wallaby. You are absolutely heartless if this evokes no emotion in you. Meet Sydney! Or maybe they spelled it Sidney. Either way, Syd. 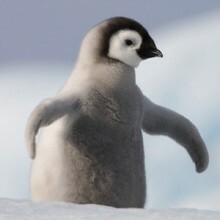 or Sid. 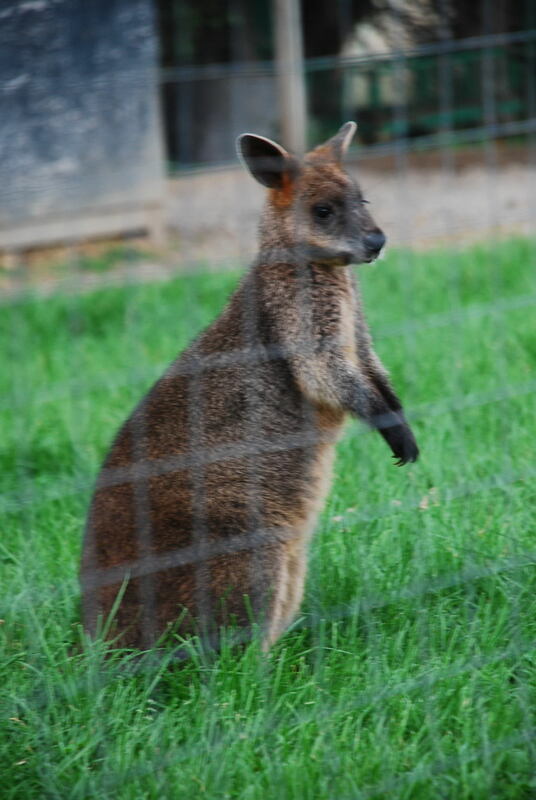 is a full grown Wallaby! NOTE: Stay tuned for 2009! Here’s a baby Porcupine that was really cranky! Only the volunteers could go near this one! 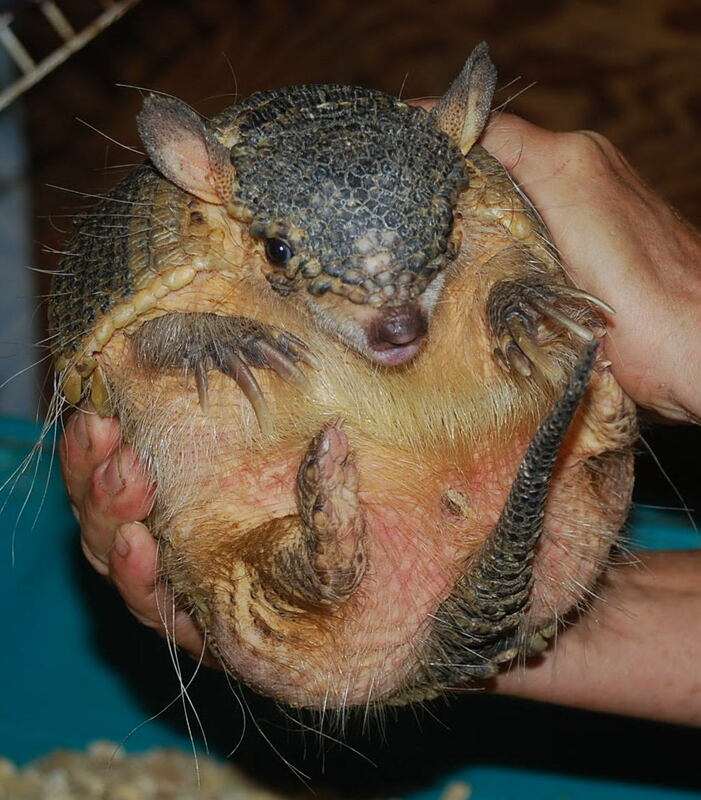 EDIT: After a comment from a reader, this critter could actually be an Armadillo. I’m sure they said “Porcupine” but with all of the excitement, maybe I was mistaken or something was missed. Either way, the critter was still really cranky! Maybe he was cranky as he was an Armadillo and people kept thinking he was a Porcupine. FURTHER EDIT: Thankfully, Jen has ended this argument and it is an Armadillo, and presumably nine banded. This is actually another Porcupine, although I have NO idea what kind! However, perfectly agreeable and not like “cranky pants,” up there. The only thing you had to do, was pet this one in the direction of the quills or…OUCH! EDIT: At least I didn’t screw up here. 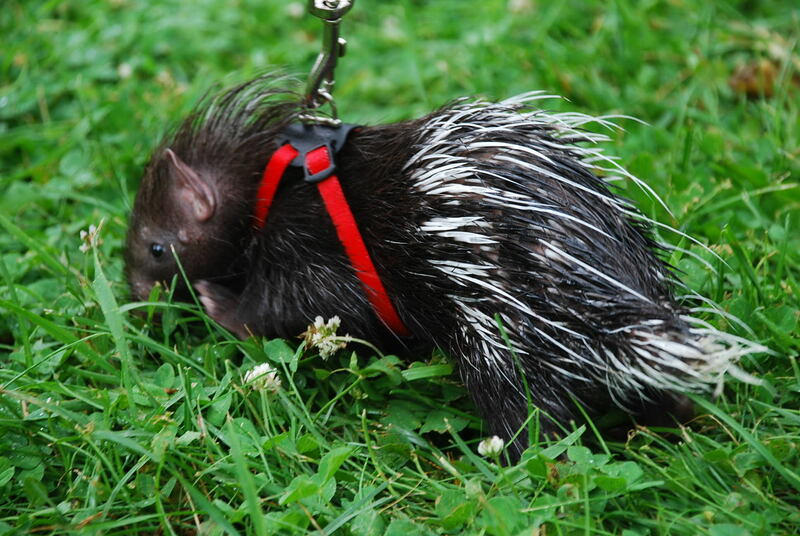 Yes, it is a porcupine. However, thank you Jen for giving me some more information. The above is a baby African Crested. First, apologies for the image quality of this one but I wanted to toss in Mr. Chameleon anyway. He was hands on, getting passed around (I didn’t get him), but that was the problem, here. In all of the commotion, he got a bit scared and “went green.” They had to quickly get him back inside. Hence, my somewhat blurry shot. 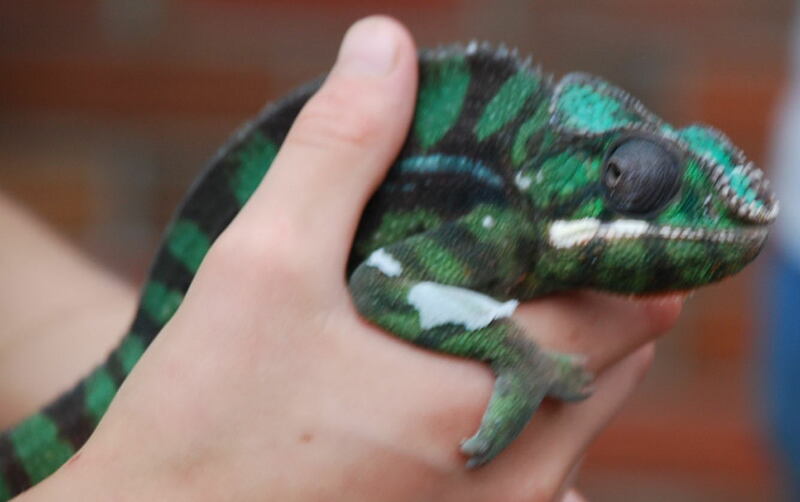 EDIT: And now according to Jen (who should maybe have her own TV show…) this is possibly a Panther Chameleon. 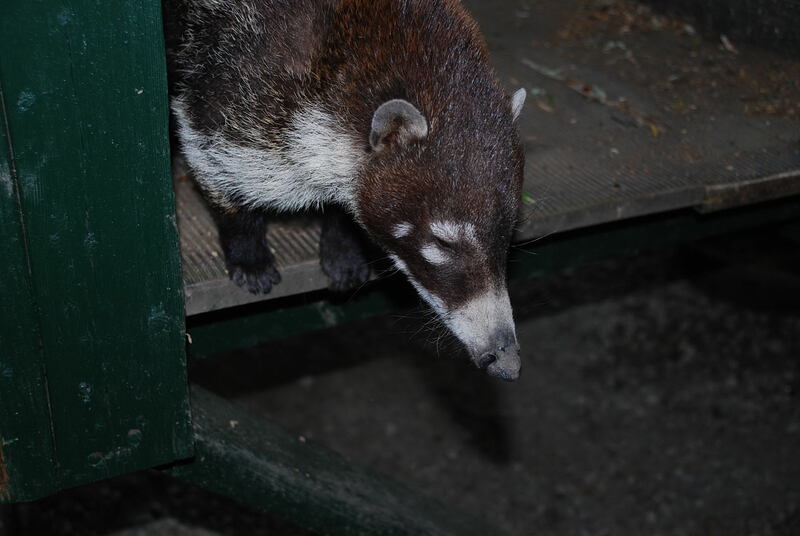 If you’ve been taking note of my hovers, no, that is not “some kind of Raccoon!” It’s called a “Coatimundi.” Now, to keep things brief, I’m not going to go into details about a lot of animals here, or on the 2009 Page. Just about what we saw and did at the Sanctuary. If you wish, you can do the research on your own. 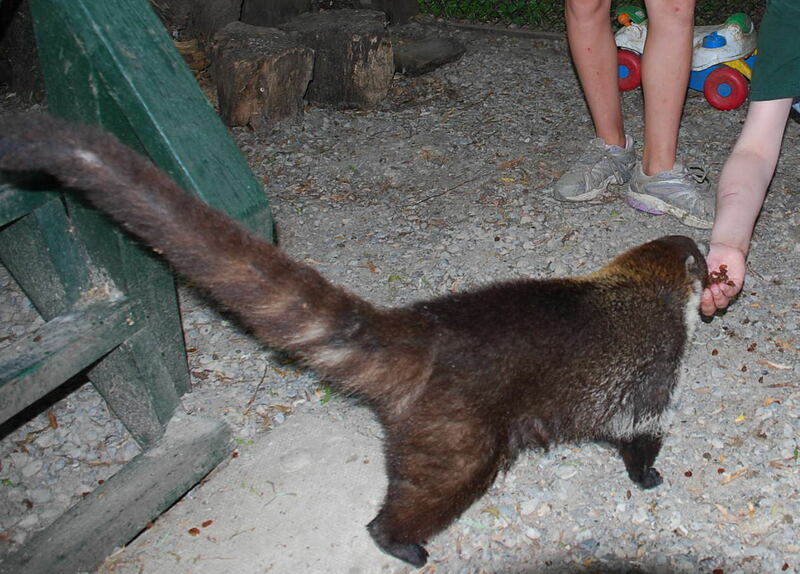 This is me feeding one of the Coatimundis within their little homestead. There were three of them living there. They do actually look “Raccoon like.” Their bodies are about the same size, but as you saw, their noses are more pointy. Also, look at that tail! I’m trying to remember, but around two feet? I fed them raisins. It was very hard as they are/were pretty skittish! EDIT: Yay to Jen one more time. I hung out with white nosed coaties but there are different types. Cool! 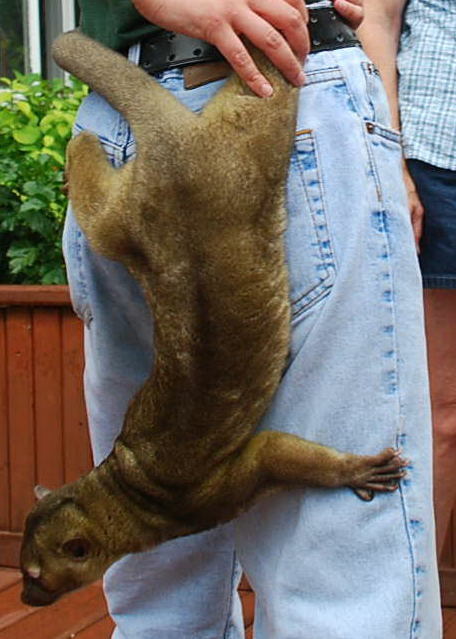 If you do not already know, I am positively mad for Primates. It has, in fact, been a lifetime dream for me to actually get to hold one. This is a Dwarf Lemur. Nocturnal and tiny! 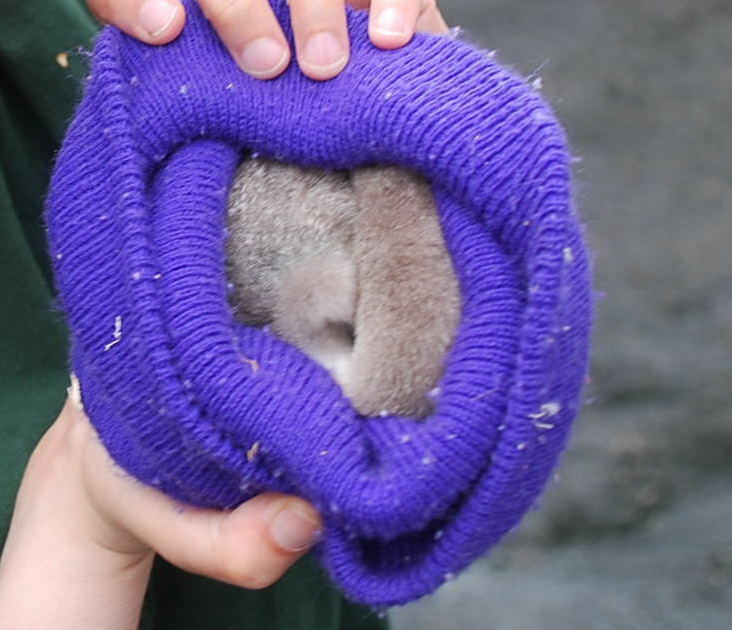 This one is tucked away in a woolen hat, and is so much “in hiding” that, yes, you can only see that little tail curled around the back of its body! We weren’t allowed to keep it out for too long to disturb it, but it was small enough that you could hold it in just the two of your hands. Alright. Here comes the “embarrassment,” but I “loved” every minute of it! This went on and on and on, but here are the best two pics of so many. Lionel was “The Main Attraction” and saved for last. 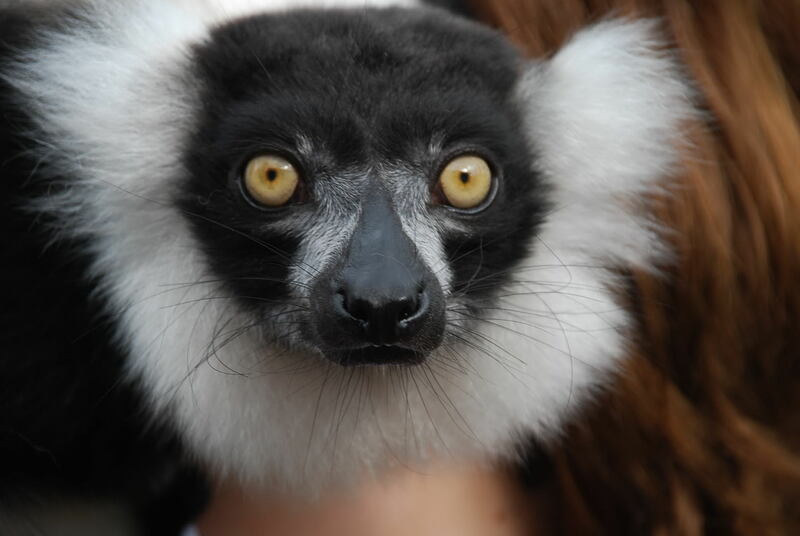 However, when I just heard they had a Lemur on the premises, I literally started spazzing out. I was jumping up and down and almost screaming! No, I literally was! I started acting like I was five years old! Of course, everyone wanted him–but only he “wanted me.” No, this is true. I waited, almost treating Lionel like he was an Aspie just like me! I didn’t want him to get “overloaded,” as he was being passed around so much. He weighed 8lbs. and you held him just like a baby. I quietly whispered his name in his ear when he came to me, just in case he needed to be calmed down. Then he went nuts! He was all over me! Kissing and licking and… Sure, you might find the above rather disgusting but no, it was GREAT!!! Yes, he actually reached up during all of the smooching and tried to take my glasses off. Well, he more than just tried, he succeeded! He really did! I had to reach back up and try and put them back on, and then it just became pointless with him! I ended up removing them completely! He was relentless! So, there he is. That’s my boyfriend. *laughing* Seriously, though. Isn’t he just gorgeous? I spoke to the woman before we left and told her about my diagnoses, how impressed I was with her, the place, just everything! She then replied, that was why Lionel acted the way he did with me, and only with me. He sensed it. 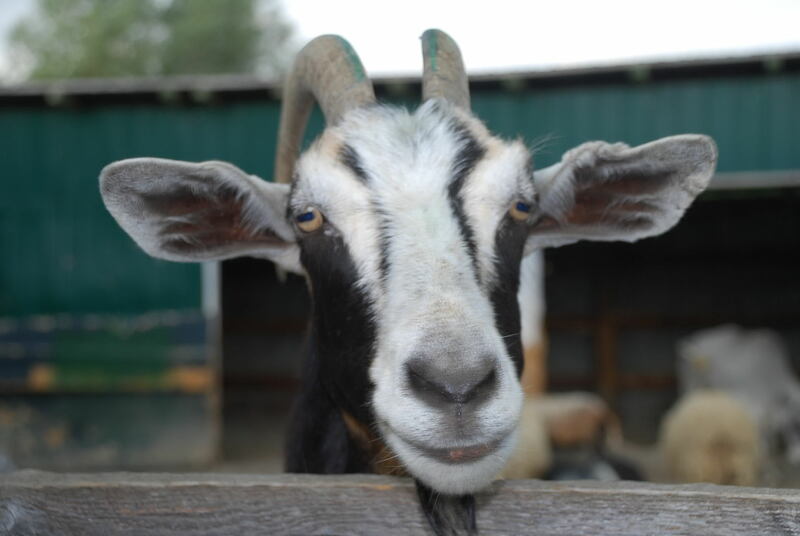 He sensed that I was like all of the others that came there to benefit from working with the animals for therapy. I only got to play with macaques. Lemurs are better. Hi Arkay. So good to see you! 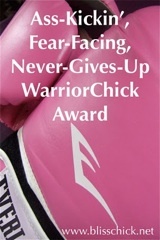 You were one of my “faithful” and one of my “bullies” (who kept giving me a good, verbal thrashing), to get this done. I am so glad you enjoyed it. I hope it was worth the wait. Thanks for the hugs, too. Oh darkentries! I’ve missed you, too! So good to see you, as well! You were another one who waited so long. I’m glad you like Lemurs! Yes, Lionel was just amazing. Actually, not even a suitable word! like an armadillo to me. Hi Gerry. 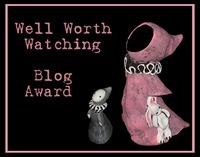 Nice to meet you and welcome to my blog. I’m happy you came to comment on, and view this page. Both the 2008 and 2009 are very important to me. This little creature was stored along with a bunch of others in a shed-like building, so lots to see in there. Thus, volunteers required. I’m pretty sure “porcupine” was said. The reason there may be some confusion is because so many of the animals were exotic. Some looked like others when they really weren’t! Still, good point. I have a list of animals and it says they did have an armadillo. However, it was impossible for us see everything. I know it’s impossible for them to keep their paperwork up to date with so many animals coming and going all the time, and them being a not-for profit. Even in 2009 there were so many changes. Unfortunately, said critter wasn’t there when I went back in 2009, so I can’t confirm. I also just checked their website for any photos. Nope. Alright, now I have gone to the “Almighty Google.” It’s not like I could do a search for “Exotic Porcupines” but “Baby Armadillo” was easier. Methinks mefinds something possibly similar looking? Methinks medidn’t make a bet with you was possibly a good idea? I’ll amend the page to say it might be an armadillo or something. Whoa! Fountain of information! Exactly what I need for both of my pages here. We whipped through the place SO fast and seeing a lot of “exotics” (at least for people living in Canada) it became a bit of a free for all. Thanks for letting me know. I’ll make my changes right now. What a nice experience for you – I’m jealous. 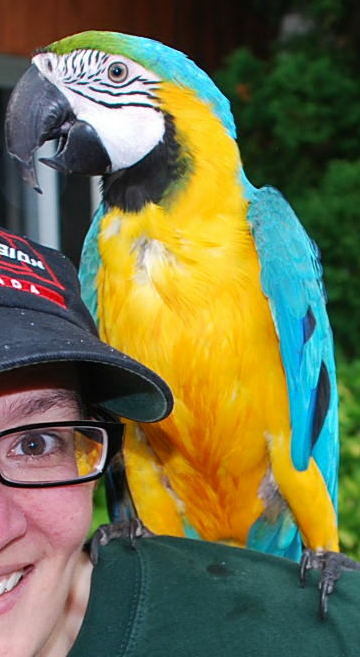 How cool to get up close and personal with these exotic animals…and to have the pix to remember it by! You are officially an ambassador to the wild kingdom. As such, you are implored to espouse their consideration by us humans. Thank you! Hi paul muller. 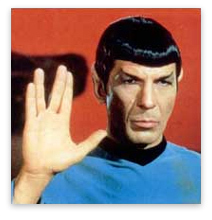 Welcome to my blog as I don’t believe we’ve met. Thank you for your lovely comment, as well. I’m sorry you feel jealous. I didn’t get to make it up for 2010 and it looks like I’m not for 2011, either. I guess the person planning it isn’t doing it. But how about if I end up there again, I’ll give you a shout? I am not positive the place you are getting your information, but great topic. I needs to spend some time finding out more or understanding more. Thank you for excellent information I was on the lookout for this info for my mission. Please, take no offense. It is extremely rare that I see someone caught that is not Spam. The information? Well, I won’t necessarily admit that it is 100% accurate. 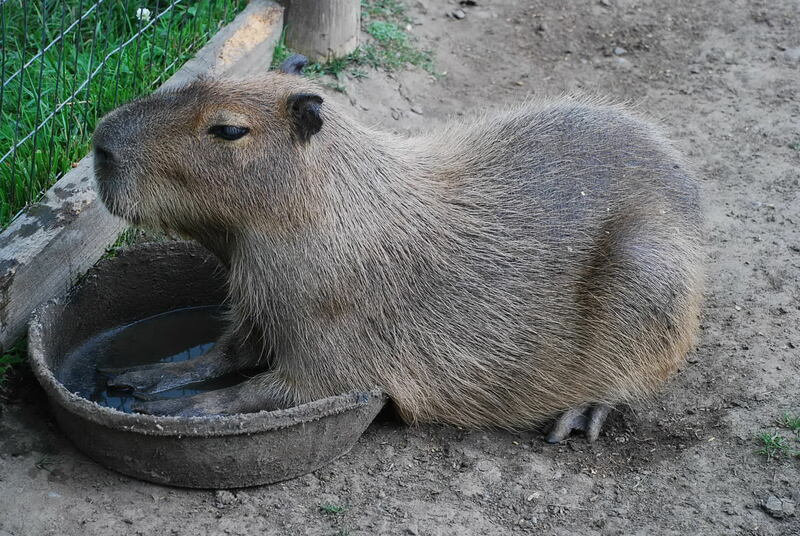 I have had some readers correct me on specific animals where I have placed incorrect hovers or text. This has been largely in part because of our visits. Everyone can go on a total “free-for-all” and run around to see all the animals at times–with supervision. Then there are times where we have been gathered in a group to see “groups” of certain animals–and lots of them! Nonetheless, it is an amazing facility. Closed to the public. Meant for therapy for kids/people on the Autistic Spectrum and/or those with other Special Needs. Not to mention they rescue and rehabilitate animals if necessary. Give them proper environments to live as well. Fabulous!